Hourglass Jenna, Jolie, & Just Breathe – A Yoga & Art Night! Join us for an evening of quiet space, slow flow yoga, creative energy, & zentangle art. Our art-driven yoga instructor Jenna Spurlock, along with our resident flock member & art educator Jolie Spelman, will be your guides for a therapeutic night of higher awareness of yourself and the world around you, as you settle into creativity. We will begin with breathing, guided meditation, & a 45- minute slow gentle flow yoga class before we grab a seat in our “art” studio side, where Jolie will talk us through creating zentangles. 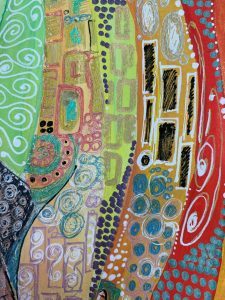 Part drawing, part painting, with rich colors & textures; zentangles are achievable art for all. These drawings allow you to relax, focus, tap into imagination, & discover fun & healing with creative expression. At the end of the night, you will take them home! All materials provided.